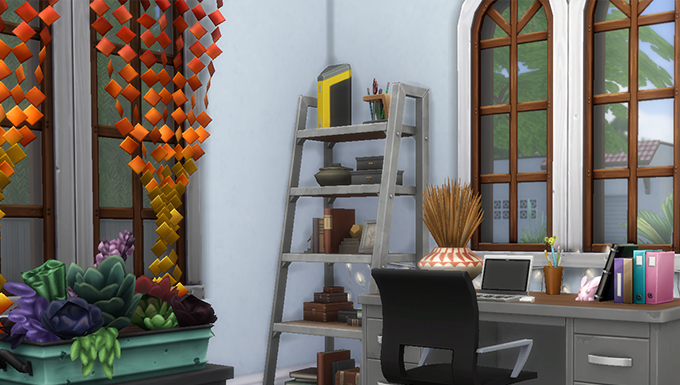 Building in The Sims is really fun, but it can be intimidating for people who’d like to practice more in build mode. The number one comment I always hear about build mode is, “All I can build is a box!” This new series is designed to show you that, with build mode tools at your disposal, you can build so much more! We’re going to make a home in this series, and we’ll try to make it as far from boxy as possible. You can follow along by making this build yourself, or try a different style while following these techniques. We’ll start by making a box… the very shape we’re trying to avoid later. The main problem that originates from boxy builds comes from not looking past the box! So what else can you see? Is it longer than it is wide? Is it a square? Are there spaces with a lot of flat area? Break down your box into potential areas where detail can go. The worst thing you can do is stop with this step here! Once you’ve found areas that are a bit too big and in need of detail, you can add some by changing the shape. No colors right now, no textures, just working with the flatness of the walls. 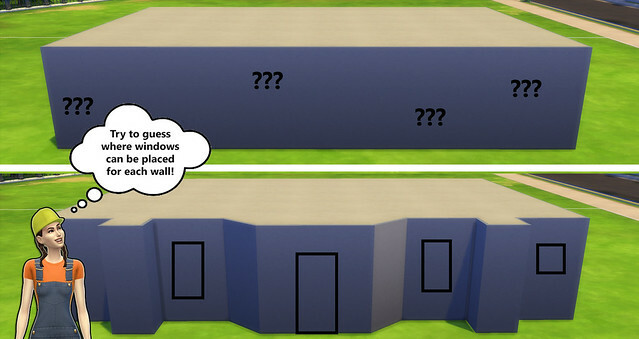 The two walls below are exactly the same, except for the 3D effects that are added. 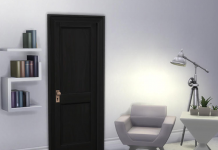 Notice that by adding extensions, alcoves, columns, and dividers, not only do you make the wall appear more busy, but you also make a great framework for adding decorative items later on! In our example build, we are going to add different sections on to the main box. You can see that porches are added as well, since they can also draw notice away from the large, flat walls. Notice that the box is still the main shape, and none of the additions are competing with it due to size. Keeping one large, main shape makes things easier later on when thinking about roofing. 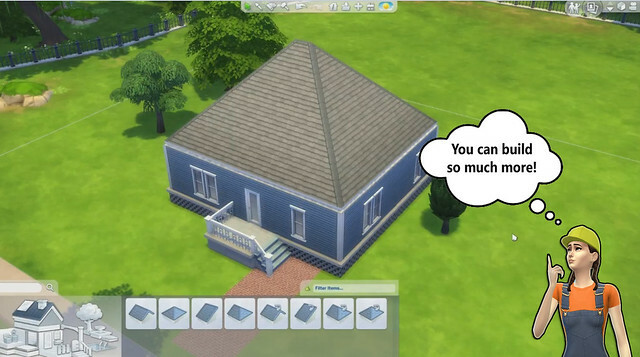 Oh, roofing: a scary word in the world of The Sims. 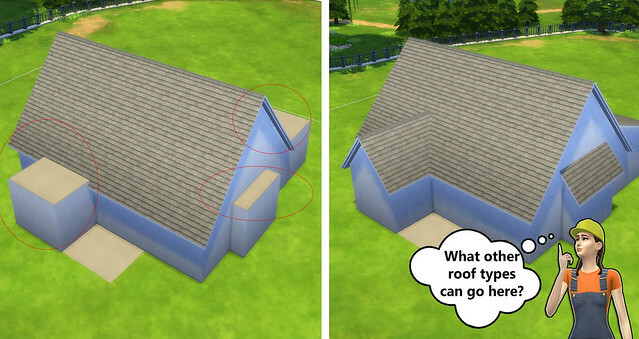 Roofing looks difficult, but it can actually be a fun little puzzle to attempt if you go slowly and patiently. 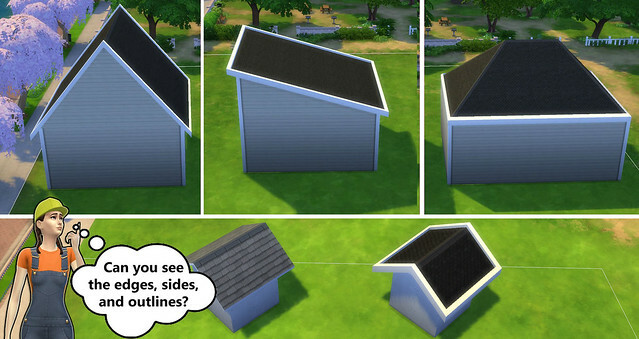 First, pick the style of roof that will go on your main box. Gabled, half-gabled, and hipped roofs are the go-to choices since they don’t look odd when sized up. Pick materials that can guide you through the roofing process; having a dark roof color and a big outline makes determining roof flow a lot easier. 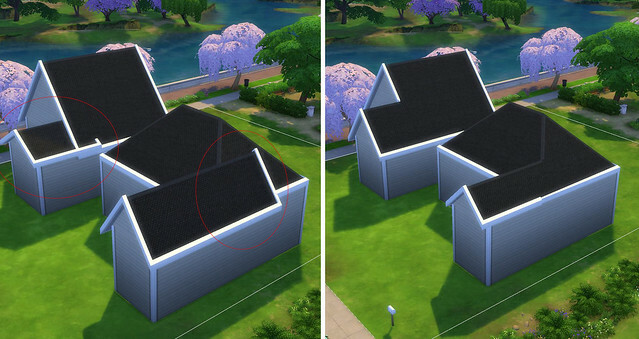 Raise or lower the accent roofs to match the flow of the main roof. You can tell if it’s flowing if the edges and outlines match. If you’re working with roofs that don’t intersect, make sure that nothing is poking out, roof slopes are parallel, and flat roofs are outlined. 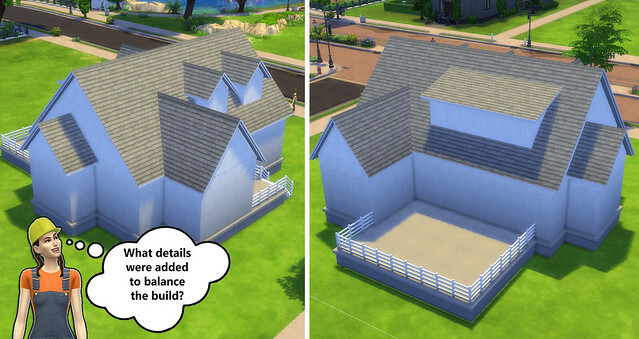 Going back to the example build, you can easily tell where accent roofs are needed after the main roof goes up. A confusing base became a lot less so. After you know where other roofs need to go, have fun experimenting with the roofs and flow until you get a good complex. Now just because the roofing flows doesn’t mean that we’re done detailing with shape. Actually, this is the step that most people skip, and the step that can make even the fanciest build look bad: proportion. 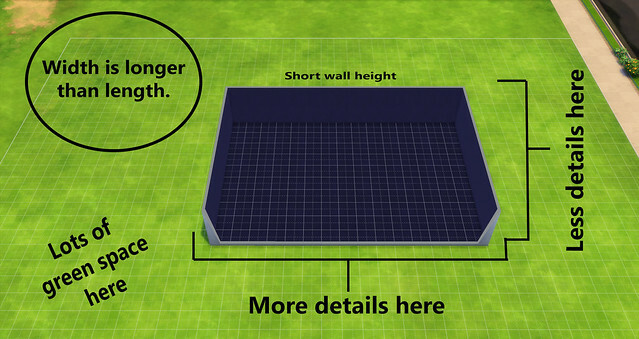 Notice how our example build has a lot of roof compared to our wall space. 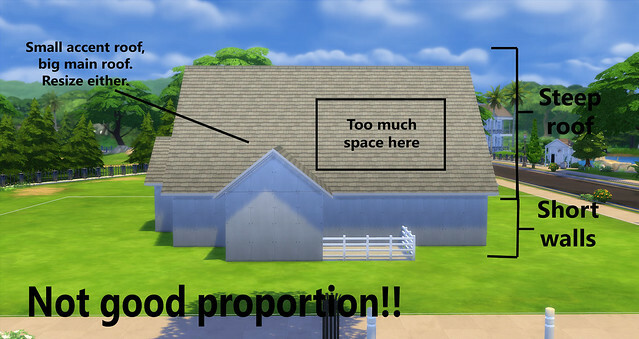 We can fix that by making the walls taller, the roof shorter, and adding a few more details. Try either playing with the curvature, adding upper-floor boxes, or building tall chimneys to increase wall detail. Remember that things don’t have to be symmetrical to be proportional. It’s actually a bit boring to do exactly the same thing, so keep details varied to spice up the build while still maintaining balance shown below. Done with the First Part! What was once a box is now a balanced, detailed house. We haven’t even touched the in-game decoratives yet! Try these tips for yourself, and keep practicing on shape and proportion this week! Next week, we’ll take a look at color and texture. You’ll be a master-builder before you know it! Start with a big, main box. Put a roof on the main box, then detail boxes. Balance the overall build with proportion. 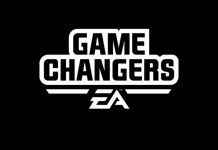 If this article was a bit wordy for you, take a look at the video below! Don’t forget to leave comments and ask questions! 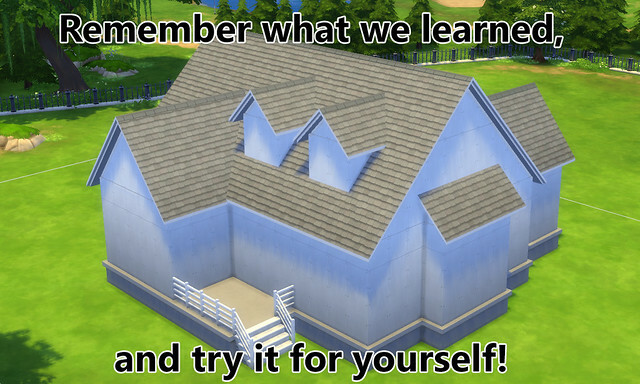 Click here for MORE building tips! Addie is a 23 year old design fan obsessed with all things Build Mode. 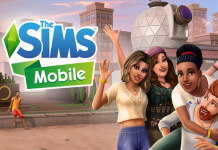 Relatively new to The Sims franchise, she picked up her copy of The Sims 4 and has been building ever since. Addie’s goal is to prove that building can be fun and easy, and everyone can make something they’re proud of.